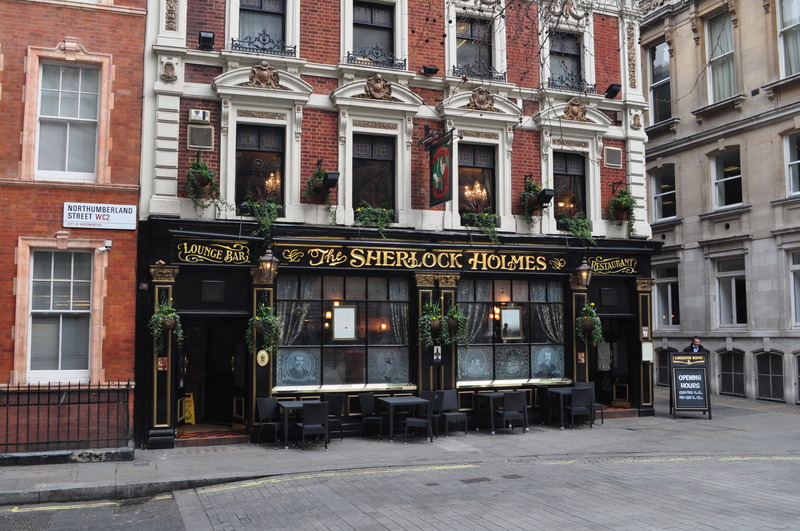 Onwards with my sleuthing in search of all things Sherlock, I met up with @AboutLondon, @IsabellesTravel and @Painting – three fab twitter friends, in the “Smoke” and started our day’s investigation over tea and toast at Speedy’s Cafe, North Gower Street, near Euston Station. 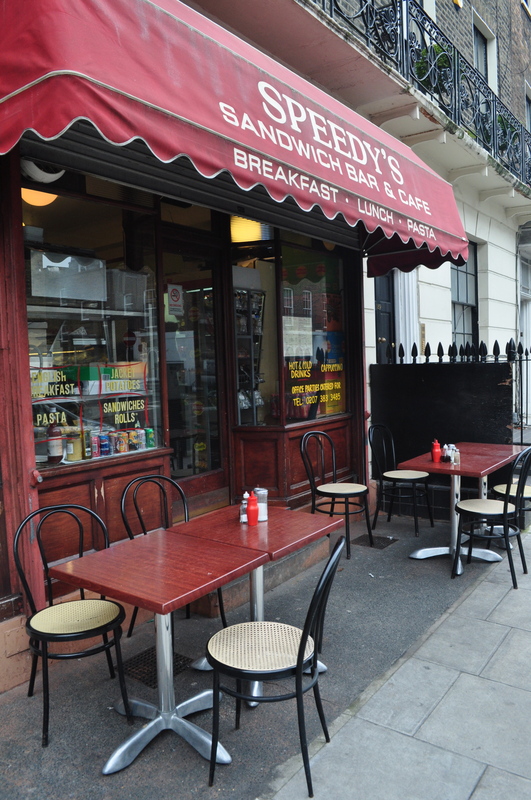 Looked down on pictures of by Benedict Cumberbatch & Martin Freeman, stars of the BBC’s current series Sherlock, Speedy’s has featured in several episodes and is frequented by both Sherlock fans and local neighbourhood workers alike. It was doing a roaring trade when we were there. After our sustenance, onto the underground and Baker Street, a magnificent old underground station which retains some of the original wood panelling and in a few areas, still feels like it might have done in Victorian times. Baker Street is, of course, part of the Metropolitan Railway, the world’s first underground railway opened in 1863. 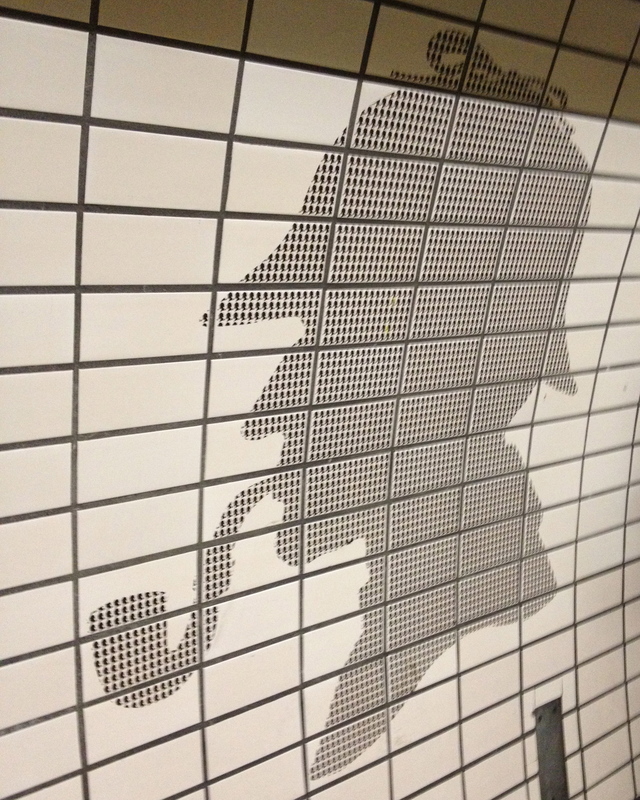 Later restorations have made the most of the Sherlock connection (221b Baker Street was where the fictional Holmes was supposed to lodge with Mrs Hudson) and there are tiles of his profile everywhere. 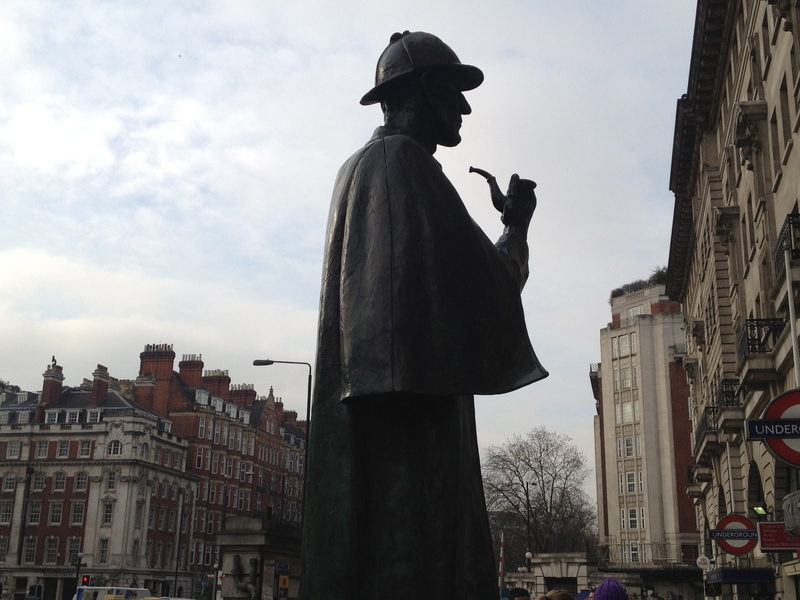 Outside, there is the larger than life-size statue of Sherlock Holmes in his most popular guise. 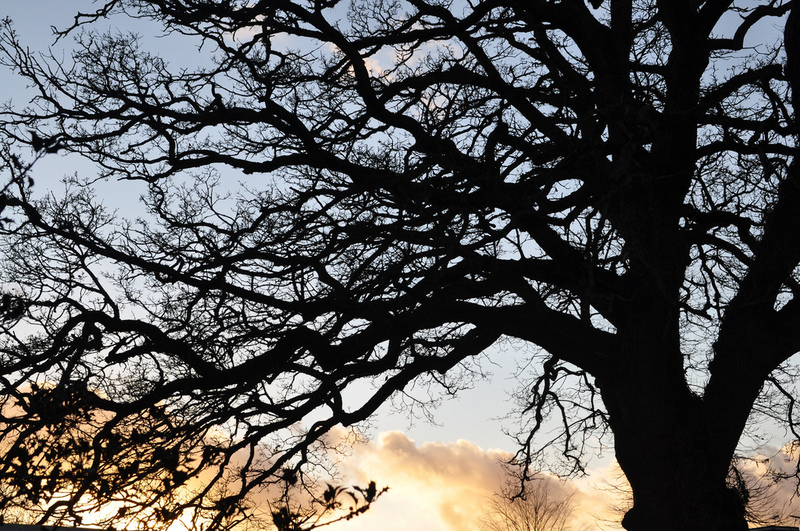 (See main picture above). 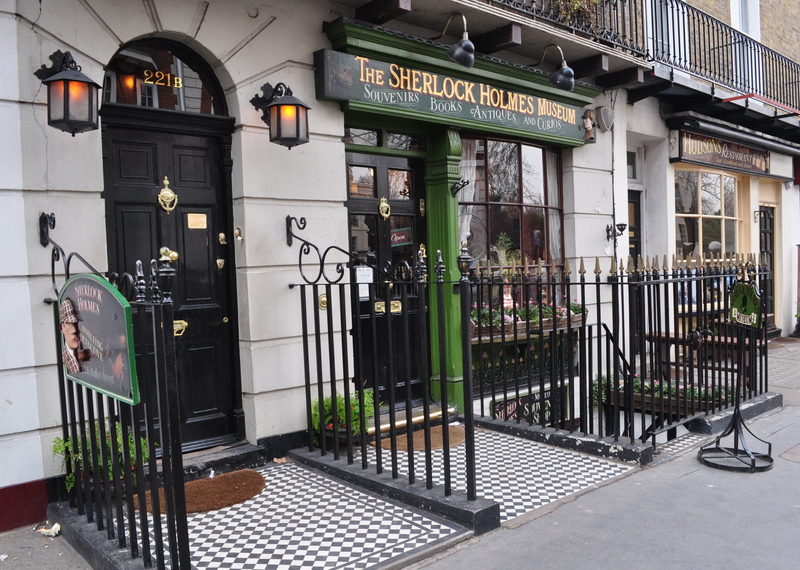 A short walk to The Sherlock Holmes Museum and 221b Baker Street, arguably the most famous address in the world. Staff dressed in Victorian attire, the shop is on the ground floor and Holmes’ bedroom and study on the first floor with Watson’s on the second. Further up still and re-enactments of Sherlock’s cases are unnervingly showcased. It may not please the purist Sherlock enthusiast but I for one loved this good-natured and well presented museum. Pure gold. See Mrs Hudson’s Restaurant next stood – priceless. Finally, our day’s sleuthing concluded at The Sherlock Holmes Pub near Charing Cross in Northumberland Street. Formerly known as The Northumberland Arms, the pub quickly had a name-change to The Sherlock Holmes Pub when their owners, Whitbread’s, bought an entire exhibition pulled together for the Festival of Britain in 1957. The exhibition was of course about Sherlock Holmes and a venue was required to house the collection following its return from a world tour. With Holmes memorabilia abounding, Sherlock Holmes study re-enacted on the first floor and items given by Sir Arthur Conan Doyle’s family, the Sherlock Holmes Pub is a very necessary stopping point on the trail of the great sleuth. By the way, Old Scotland Yard is situated just a few steps away on the other side of Northumberland Avenue.